We now at last have an Espresso Book Machine in New York City. McNally Jackson, 52 Prince Street have installed one. Congratulations! This is what the Espresso Book Machine looks like: click on the arrow in the middle of the screen to see a video about it. Now, if they have a copy of the book you are looking for on the shelves, you are unlikely to insist on their printing one for you on the Espresso machine. The book will look different — not bad, just different, and if the picture you have in your mind is the one on the shelf in front of you, that’s probably what you are going to go for. But of course no bookshop can have a copy of every book ever published, and if your book isn’t there, having a copy printed up for you in a few minutes may be an enticing offer. The page-printing part of the machine is made by Xerox, and will print a perfectly acceptable paperback book. The quality will depend on the quality of the input files: some are scanned from old library copies and will come with library markings, annotations, and thumb prints all faithfully reproduced, but many will be every bit as “clean” as the copy on the shelf. The cover will print in color on a coated paper and will not be laminated. The content may come from Google Editions, which will tend to be books scanned by Google at many libraries around the world; or more recent stuff originating from the digital holdings at Lightning Source Inc. The book at the extreme right on the photo accompanying the post below on Consistency of Appearance is from an Espresso Book Machine. Shops that have the Espresso Book Machine have tended to report satisfyingly vigorous demand: there’s an obvious charm to watching the book you want being printed in front of your eyes. As they have to finance the machine as well as provide floor-space and an operator for it, demand is an important factor. Books stores are businesses and have to be able to pay their way. Self-published works have been an important segment of the market, and as more people get more familiar with the holdings of Google Editions, which actually represent a huge and invaluable resource of almost all older books (published in English mainly), the treasures which are available only this way will become more known and Espresso demand will escalate. In spite of all the buzz about e-books etc., things are pretty slow to change in our business, but soon the idea of having the book made for you as you wait will become familiar to more and more people, and more machines will be installed. In the February 12th 2011 issue of The Economist, there’s a fascinating article about 3D (or additive) printing. In the book business we have become used to the idea that we live towards the low-tech end of the print industry. Microlithography for printing computer chips has made us look a bit crude for years. Now there’s 3D printing. There have apparently been machines out there for about 10 years to make a cheap prototype. These machines are now ready to move into the finished product end of the business. Wikipedia has a good entry which already contains a quote from The Economist article. 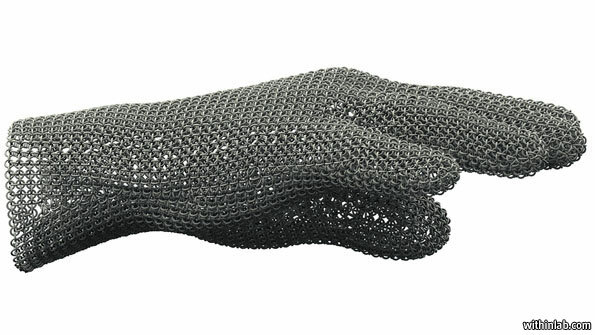 The glove which they illustrate was “printed” by Within Technologies, a London firm, and can be made in nylon, stainless steel and titanium. So when you next need that iron fist, you won’t have to wrestle with knitting it in stainless steel yarn. There are different types of printer. One type works a bit like a copier: directed by a detailed computer program it deposits a thin layer of powdered material, bakes it, and moves up to the next level doing the same again. The “baking” can either be done by a squirt of liquid blender, or by sintering with a laser or electron beam. Other machines deposit filaments of molten plastic. One additional benefit of the technology is that surplus powder can be reused, cutting down drastically on waste. As compared with old methods of making machine parts, which involved starting with a block of metal and cutting away and discarding, the bits you didn’t need*, this method uses only that material which is essential to the structure of the piece. Apparently parts can be about 60% lighter: important in aviation where a reduction in weight of 1 kilo can save about $3,000 in fuel over a year. * swarf is the word for this stuff — the little twirls of metal machined away from a block. “Why can’t the idiots get it right the first time?” Corrections are a pain: always have been; probably always will be. But things are changing. In the days of letterpress corrections were rarer, because reprints were relatively uncommon. We’d collect them, hoping that the book might one day reprint, but not with any real conviction. Now because we have all drunk the Kool-Aid of limiting inventory investment, reprinting is so common that very few books can’t expect an opportunity for correction sooner of later. It’s a paradise for the forgetful author. If we’ve been smart and archived our application files along with our PDFs, we can fairly easily get the files updated, and send them out to the printer to swap for the old version. The trigger for doing this is more than likely to be the decision to do a reprint — so someone has to scurry around getting the corrections made as fast as possible so the reprint can complete on the new super-short schedule we all now work with (for the same inventory minimization reasons). Now that we are leaving the familiar world of offset reprinting and bravely going into the digital universe, we have to rethink this process. You can’t wait for a “reprint decision” in a world where people are constantly ordering e-books or print-on-demand books. There’s never a moment at which you can stop and decide it’s time to get the corrections done. Correction has to be a continuous process, so that your files are always up to date. I can’t tell you how to do this, as we haven’t yet got there yet, but it does seem unlikely that we will want to correct the spelling of that name on page 12 today, and then next week this date in the bibliography, and so on. We’ll have to come up with some way of checking periodically what corrections we have accumulated, and making them right away. It’s self discipline, something of which we have always had a serious deficit in the world of correction. It probably also means abandoning our current jury-rigged methodolgy and spending the money to hire someone to do it properly. Designers who care will often request a drawdown in order to check what a PMS color will look like when printed on a particular paper. All papers have additives to give them their shade. Pulp has to be bleached to get it to white. Color additives are involved in getting to the required color. Compare several different “white” papers and you’ll quickly see that white doesn’t mean just one thing. There’s a color gradation within the world of book papers from bright white, though white, natural, and cream. Within that simple scheme there’s an infinite potential range: but paper mills will make to a constant recipe delivering a few standard shades. PMS (Pantone Matching System) colors are presented in a swatch book printed generally on two papers, a coated white and an uncoated white. These are quite white whites. The swatch will give you a good idea of what your job will look like when printed on a white stock as a solid in this or that PMS color. What you can’t know from the swatch book is what effect the color of the paper you plan to use will have on the ink you select. 100% PMS 184 on the white of the swatch book, may look significantly different from a 20% tint of PMS 184 on a cream stock. When a drawdown is requested, a can of PMS ink is opened and a spatula which has been dipped in it is then dragged (drawn) down a sheet of the paper to be used on press. You can see this being done in the ink-making video below. I sometimes wonder what effect this foreknowledge has: but I suppose the cautious designer will perhaps be assured of not discovering, when opening the advance copy, that those second color text boxes have turned into an ugly muddy mess. Drawdown has of course nothing to do with lay down, which is that (huge we hope) number of books moved out into the channels before publication. Excessive lay down can lead to mark down, though in our business that’ll no doubt be preceded by massive returns. In pre-digital days the flats for that marked-down book might have been subjected to tear down, before restripping for a smaller sheet-fed press. Is it odd that it was always paste up not paste down? I guess we would paste down an individual bit of repro as part of a paste up. A paste-down is actually that part of the endpaper which is pasted onto the inside of the case. GalleyCat carried a piece on 13 January 2011 on “What’s the best font for a book?” reporting on some research at The Font Feed — apparently the winners were 1. Minion, 2. ITC New Baskerville, 3. FF Scala, 4. FF Scala Sans, 5. Adobe Garamond. This result was based on the most frequently used typefaces in the winners of the Association of American University Presses’ Book Show from 2006 to 2008. The Font Feed article is here. I’ve added The Font Feed to my Blogroll below. Of course typefaces are a matter of personal preference. There are (or used to be, when the world was restricted to hot metal setting) some fonts which were more appropriate for this job or that job. We used to use a font called Modern quite a lot for mathematics, no doubt because the University Press had a huge range of matrices for special sorts. Bembo was a favorite for literary studies: it sort of had that feel to it. Garamond too. You wouldn’t use them for a mathematical book: it just wouldn’t have looked serious (quite apart from the sorts problem). If the book was long you might set it in Ehrhardt, which set narrow. Baskerville was of course a favorite in Cambridge. I once did a Bible in ITC Weidemann because I figured out that at the time it was the narrowest setting font available, and getting more characters onto a line in a two-column pocket bible made quite a dramatic difference in the page count. It’s not a handsome font, but perfectly serviceable, and remains surprisingly legible at small sizes because of its short ascenders — another feature that recommends it for Bible work. We now live in a world where the conflicting forces of standardization and the easy availability of thousands of different fonts continue to duke it out. American book design has always tended to be more flashy than British — or if you prefer the other end of the telescope, British design was always duller than American. I should confess to preferring the understated. Stanley Morison (spearhead of the typographic revolution in early 20th century Britain, Typographical Advisor to Cambridge University Press’ Printing House, epicenter of the revolution, designer of Times Roman) wrote a little book in which he made a case for setting an entire book in one size of a single typeface. Extreme perhaps, but not ineffective. Modern design seems to favor the use of a display font for title page, chapter tiles and often more. I’ve worked on books imported from the UK by American publishers where they have kept the UK text setting with all its “colour” and “honour” but changed the chapter titles to some impressive (incongruous) display face. In this day of everyman his own designer we see all sorts of things which must keep Morison spinning in his grave. A week or two ago I tried to answer a customer query about the typeface used in a book published about 25 years ago. It was a buy-in from a British publisher, so we had no information on file. It turned out to have two text fonts used in a pattern I’ve not really figured out yet. It looks like the “other” face was used for the introductory passage in each chapter, but I have not read the book, an extremely long historical work, so am not certain what’s going on. My typeface identification methodology is simply to flip through my copy of the 1989 edition of LinoType Collection, The Mergenthaler Type Library looking for a cap W that matches. From there I’d go to the cap M, and that would generally rule the font out: on to the next. A match would mean you flip on the the next letter, maybe the lower case g, and so on. If you find it you’ll know it. Not really very elegant — a sort of sledgehammer approach. I had no success. I then looked into on-line typeface identification, which phrase I googled. Fonts.com, Identifont are a couple of sites offering this service. It worked in the same way, but it started with Cap Q, not a character that you find on every page, though there were enough queens in this book, so it wasn’t too hard to find one. If the Q is like this or that you go on to another letter and so on till the system tells you its answer. It said Dante, a Monotype font which unsurprisingly doesn’t appear in the Mergenthaler book. (Mergenthaler = Linotype, the competition in hot metal days for the Monotype Corp.) I was quite pleased as that showed I hadn’t done something wrong, but that my toolbox had just not contained the right item. I like Dante. There was a university press in America which would order the typesetting of every volume in a lengthy series through me for setting in Cambridge, which was one of the few places in the world that had a decent array of type sizes and sorts in Dante. Years later I was tangentially involved in the an enquiry about the sale of this very array of matrices to one of the last surviving commercial hot-metal book houses in America. So liking Dante, I was sure that must be the answer. Worryingly however when I repeated the process in the same site, I came up with a different answer! And as for the other text font, I could get no answer that wasn’t obviously wrong whatever the cap Q etc. might be insisting. So maybe these sites are not fool-proof. I did come upon one site which suggested you photograph a page of the book with you iPhone, and let it run a comparison. This I did not test.